I’m still high off the pesto. I kid you not, I’ve been humming ‘Suite: Judy Blue Eyes’ all the live-long night. I’m shaming Crosby, Stills, and Nash, I’m sure, but I’m convinced they would forgive me after this magnum opus. Nothing makes me happier than an exceptional meal. It doesn’t have to be decadent or costly. Just high quality, complimentary ingredients cooked (or not) just the right amount. 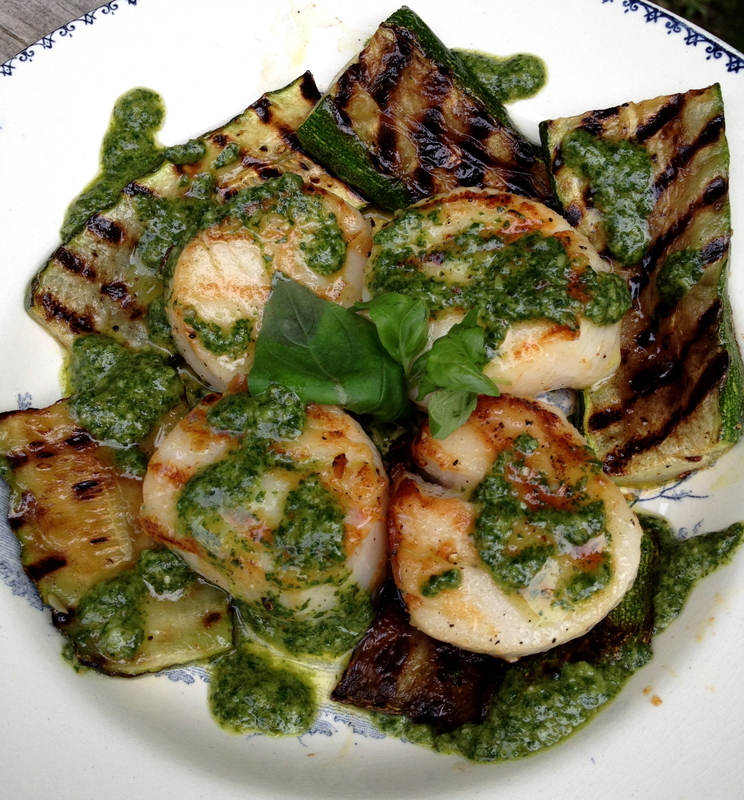 Tonight’s tour de force: Grilled scallops and grilled zucchini with pitch perfect pesto. A light, succulent meal with so few parts but so perfectly orchestrated, redolent of a great musical. Ingredients: Enough sea scallops for however many are eating. I think 4 each is plenty. 3 large zucchini should do the trick for 4 people. For the pesto: 2 cups lightly packed basil leaves, 1 clove garlic, about 1/2 cup extra virgin olive oil, about 1 tablespoon or a little more of freshly grated Parmigiano Reggiano, 1 tablespoon lightly toasted pine nuts, pinch o’ salt.